Last week I attended a Dr. Ken Callahan Seminar where he effectively reminded us that churches are active mission outposts, pastors are shepherd leaders, and the community is a family. Three months from today on June 25, 2014 I will be the new pastor of a vibrant and exciting church. How will the transition go? Will I be ready? I have high expectations that everything will be absolutely great, but I am reminded of Loren Mead’s description of pastoral transition as “running through thistles.” Ouch! I want to avoid as many “ouches” as I can! In preparation I have been rereading some familiar material about starting well in a new parish. One of the best and concise books is The First 100 Days: A Pastor’s Guide by T. Scott Daniels. It is a book that challenges me to pay attention to God, my family, and my next parish. We have all heard mentors and advisors say, “Just love the people!” But every church is different and so is every pastor. Some congregations are in the throes of separation anxiety because they love their current pastor so much. Every mentor I’ve had has expressed how much better it is to follow someone who is loved than a clergyperson who is disliked. Following a beloved pastor may make things a bit rough at first but early on the family lovingly absorbs you into its fabric. That’s their pattern! To follow someone ineffective or disliked makes you the quick hero, but the angst and anger toward that pastor is just as quickly transferred to you as the love was in the first scenario. The challenge is to do well in either case. I need to get to know the church by becoming a keen sociologist and historian, by working hard to understand the church’s current reality and its processes from vision to finances; and by falling deeply in love with the community. “How do they do things here?” can be answered through bulletins or orders of worship – videos of high Sundays and the ones in between would be extremely helpful. However, from a sociological point of view, how is this church a family? What is its unwritten but very real ethos and set of family rules? How do they talk and do I have the capacity to speak the same language? Learning what “funeralizing” someone meant became extremely important when I moved from seminary in Boston to a three-point charge in the Pee Dee region of South Carolina! I specifically remember being asked to go visit someone and given a country store and a “colyum” as landmarks. I was supposed to go past the store and take a right at the “colyum.” I found the store but I had no idea what a “colyum” was. When I went back to the store and asked where the person’s house was and they said, “Take a right at the ‘colyum.’” My response was, “Could you spell that for me?” They answered: “C-O-L-U-M-N!” Oh….. I got it and made it to my destination. I had to learn the lingo, the church and community’s history, the expectations of the pastor, the lay leadership, the flow of the worship services, the people who needed immediate pastoral care, the vision and plans of the church, and all the mundane but IMPORTANT idiosyncrasies of that unique family. The greatest challenge was joining the family! One of the metaphors that The First 100 Days uses is that a new pastor is someone who has been invited to become a “facilitator at someone else’s family reunion.” A new minister isn’t a member of the family automatically any more than a new son-in-law or daughter-in-law is. Newbies have “positional authority” by virtue of their legal or titular standing; i.e., “This is my ____ ___ ______.” However, they don’t have real authority until it’s earned or, I daresay, a grandchild comes along! Some clergy try to get by as long as they can by the “reputational authority” they’re given by their predecessor, the inquisitive detectives in the church who check them out ahead of time, the Bishop, or their bio. I am firmly convinced that pastors don’t really get an invitation to join the family until they acquire “relational authority” through significant interactions with people. Please note that the word “authority” does NOT carry its usual heavy-handed meaning. Since “authority” comes from the word “author,” it really means doing something creative and productive rather than destructive; as Hebrews 12:2 describes Jesus as “the author and perfecter of our faith.” Authority built through relationships with people and communities isn’t engendered through titles and degrees. It comes through an incarnational presence with people at their most important life events: illnesses, births, deaths, marriages, crises – whenever and wherever the clergyperson is invited to be a part of the new family. According to author Scott Daniels the notion of “The First 100 Days” was originated by President Franklin Delano Roosevelt after his inauguration in 1933. In the midst of the Great Depression he and Congress paved the way for the main components of the New Deal to be enacted in his first 100 days in office. It wouldn’t have happened unless he had the political capital to get it done. FDR had almost two years of campaigning under his belt before the clock started on his presidency. During those two years FDR articulated and garnered support for what was accomplished in his first 100 days! New pastors don’t have that luxury or capital! In quick-step time we must gain capital through relational leadership with careful attention to avoid rushing. It sounds like an oxymoron to hit the ground running while going slow enough to really get to know the lay of the land. Relational authority has to be earned and that takes time, skill, and observation. It also requires the support of a new church family that is willing to be helpful, supportive, and patient. The most important key for all concerned is to trust in Jesus and follow His example. Then the rest will take care of itself! Poor listening has been called “selective hearing.” With about a week to go before we make appointments, I have been duly described and resemble the remark! Do I listen selectively to the S/PPRC or to the clergy? Do we as a Cabinet value the input of clergy over churches, churches over clergy, or give a fair hearing to all? These are tough questions, and starting March 3 we will find out the answers. In my mind, clergy exist for churches, not the other way around. There are, however, special circumstances that may warrant extra consideration in terms of clergy assignments. Children’s education, proximity to doctors, and spousal employment come to mind. All that being said, in the United Methodist Church, clergy gave up their right to preferential treatment when they committed to the itinerancy. We go where we’re sent and I personally know the ramifications. We found out that we were going to move just before annual conference one year. A clergyperson died suddenly and the Bishop called. The difficulty was that Narcie was going into her high school senior year, Cindy loved her job, and on top of those considerations the raise I was to receive was $300 annualized. Not a lot considering the sacrifice my family was going to make, but everything worked out! We stayed there 9 years and Narcie must not have been too affected by it since she’s a UM clergyperson now. I have taken a big cut since then, too, but fruitful ministry has resulted in spite of my reservations! I guess the point is that fruitfulness always trumps personal prerogative. The Cabinet will do everything that we can to make churches and clergy happy. I know that this is a tense time for clergy and churches because I have had last ditch efforts thrown my way for several weeks now. There are clergy who a month ago wanted to move that now want to renege. There are churches who would rather keep their known pastor rather than risk receiving the unknown. Why? I think that the answer is quite evident. We have all been burned by bad matches. I remember several years ago when we had a pastor that was low on about everybody’s list, and a DS took an educated chance. It ended up as a great match! I have seen pastors whose DS oversold them and it hasn’t worked out at all. I had a preacher come in here the other day who blatantly stated that they felt like they deserved a promotion. After a lengthy discussion of this person’s track record, I attempted to speak the truth in love that this person’s fruitfulness had been spotty at best. Of course, as usual, I got plenty of valid and not-so-valid excuses. We have all heard them, whatever the profession or avocation: “It was my predecessor’s fault; the church didn’t want to grow; the church didn’t serve the community; they were dysfunctional; a family chapel; too liberal, too conservative, too conflicted; they wanted a white male, a female (wish I heard that one more), and on and on.” I have heard churches voice the usual: “We want someone with experience who’s 25.” Good luck with that! There comes a point in time when the reality adds up to mediocrity and a person’s portfolio of ministry simply falls short of everyone’s expectations. Sure, they did good things, people’s lives were touched, but they either didn’t light up the scoreboard or outkicked their coverage. Maybe they could thrive in a greater work, but the facts seem to dictate that they would be better off serving a lesser one. Since gauging what’s greater and lesser is often theologically and empirically impossible, maybe they need to do something entirely different with their life which gets to a key point for me. What if a lot of our mediocrity in the pew and the pulpit is due to people’s high expectations and low performance? What if our clergy problem is because people went searching for God by going to seminary and came out with a degree in hand and ended up looking for a career? We must recapture the theology and language of call over career. I honestly think that most clergy feel called, but I am afraid that along the way the call for many has dissipated into a career. We don’t have time as the church in a hurting world to dither between play acting as either church members or as clergy. It’s time to get real! Church members who don’t take discipleship seriously should NOT serve as church council members. Put those nominal Christians and a pastor who is career minded together and the certain result is a lack of fruitfulness. One of the biggest myths for United Methodist clergy is that your ministry track will be this long ever-climbing straight line from the bottom at the beginning to the top at the end with an ever increasing salary. The reality is that the ministry track for many persons should look like a bell curve which is low in the beginning, peaks in the middle, then concludes with a tapering and diminishing end. There are some clergy who do keep rising until they retire but they are few and far between, and they aren’t into comparing themselves with other clergy. They bloom where they’re planted and go where they are sent! Their fruitfulness hasn’t diminished and won’t! I have seen S/PPRC’s buy into mythology when they think that if they cut the salary they’ll get a young preacher, or if they raise the salary they’ll get a better one. Myths abound for clergy and laity alike! Unfortunately, sometimes myth becomes reality. Regardless, any clergyperson who thinks that their worth is determined by salary is bound to be disappointed. Any church that worships their pastor and/or puts restrictions on their pastor’s preferred gender, race, age, family size, or marital status is limiting what the Holy Spirit can possibly do in their parish. The truth as I see it is that we go as clergy where we’re sent and churches receive whomever they are sent. Sounds simple, and I thought it was 8 years ago when I came on the Cabinet. I know better now. Matching clergy and churches is unbelievably difficult. Cabinets try to listen carefully to your needs with a primary focus on local church fruitfulness. We try to avoid stereotypes about age, race, gender, location, and where someone went to seminary. I am firmly convinced now that teaching each clergyperson and church how to complete a pastor/church profile would go a long way in helping everyone involved start off on the right foot. That profile is a welcome mat to your soul as a person or as a church. Get it right because selective hearing is hard to correct if what you’re saying is garbled! It’s been my pleasure to teach the Advanced Lay Servant course, “From Your Heart to Theirs” for the past 7 years. My last stint starts Sunday week. It’s a course that is subtitled, “Delivering an Effective Sermon.” The gist of the whole course is to encourage Lay Servants to realize that the best message is one that comes from the heart and touches someone else’s. The official teacher’s guide to the course is good and helpful, but like many curricula it needs tweaking to juice it up and grab the attention of the students. The first week of class is mostly lecture with facts about different kinds of sermons, Bible interpretation aids, pluses and minuses of manuscript versus extemporaneous preaching styles, use of the hymnal, and tips on how to use one’s voice more effectively. The bottom line is that the course is about making it personal. The second week is when we listen to each other to see if that’s what we’ve done. A “heart-to-heart” message is authentic, genuine, and has immediate “street cred.” It is not about sharing a speaker’s glamorous life events, but sharing how our ordinary lives intersect with and are really a part of God’s bigger narrative. The Scriptures are the text and we are the illustrations. Of course, I know that good sermons depend upon thorough exegesis; an interpretation from or out of the text itself. The biggest temptation in preaching a “heart-to-heart” sermon is a tendency to depend on eisegesis; a reading into the text from our own experiences and perspectives. I submit that although exegesis is most important, the application of that knowledge into our contemporary existence through eisegesis is vital, too. We are required to superimpose our stories onto Scripture in order to be real and relevant. Therefore, I often find myself preaching in a way that uses my personal narrative in an illustrative manner. The Scripture speaks for itself, but I also need to share how it has applied to my life. My children would have gladly preferred that I kept much of this to myself through the years, and I agree. Too much of the preacher’s story and not enough of Jesus’ makes for a self-centered, look-at-me-and-say-“wow!” hubris. Sharing too much of my children’s stories, usually without their permission, was downright embarrassing! I exposed their lives to a critical public. I may have seen the moral of the story, but my kids and parishioners probably thought, “There he goes again, tooting his horn about his family.” Now, granted, most of the time these stories were self-deprecating, but it was still overdone. The sermon should be mostly about God’s salvific work than about me-me-me even if primarily about foibles! On the other hand, an all-exegesis sermon can sound like a commentary read aloud – b-o-r-i-n-g! There needs to be a balance, and sermons need to be as creative as the Creator! The emphasis of the teacher’s guide for “From Your Heart to Theirs” is to help students realize that they already have a basis for ready-made sermon illustrations. Their personal experiences are the source. The seductive pitfall, however, is to start from experience and then hunt a Bible text to back it up. I encourage using the lectionary as the foundation for any given Sunday’s sermon, praying and studying through the passage and other information, then pondering where a speaker’s life and the text meet. Then tell the story! This process is where the rubber meets the road for Lay Servants, Lay Speakers, and clergy. All of us can benefit from using a timeline of the key events in our lives. Those events can provide tons of illustrations about God’s providence and our obedience to or thwarting of God’s perfect will. Baptisms, marriages, deaths, grammar school antics, high school friendships and graduations, college encounters, adult friendships, love and heartbreak, parenting, illnesses and the like can provide living proof of God’s faithfulness. Stories that make these scenes come to life animate the sermon and enliven the speaker who can “see” what’s being shared and say it more easily than rattling off a memorized illustration or someone else’s humorous story. The hearers can easily connect their similar adventures or misadventures, and find themselves drawn into God’s narrative. It makes preaching more than just an “inner dance,” as someone has called it. It becomes a “conga line” that brings everyone along! I appreciate so much the work of Lay Servants. It is an honor to be asked to teach preaching, and it is a blessing when these students fill our pulpits when clergy are out sick or we’re celebrating Laity Sunday – whenever! Preaching is an art that can be learned if laity and clergy alike are willing to tell God’s story and their story in such a way that’s faithful to Scripture and magnifies Christ. Thank you to every Lay Servant and Lay Speaker for all that you do to bring God’s Word to life! We’re all walking sermons! I saw a sign in front of a church that looked downright wrong to me. I’m sure they meant something else. 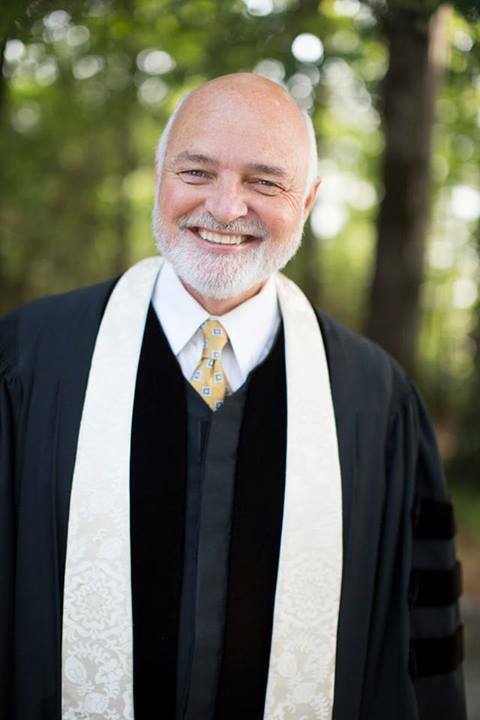 It said, “Don’t let worry kill you, let the church help.” As a District Superintendent in the United Methodist Church I have experienced the unfortunate reality that sometimes the church can exacerbate worries more than help them. Church squabbles and differences of opinion distract too many Christians and turn them into worriers. What a great spiritual discipline, especially if you are a worrier. “Turn your worries into prayers!” is an often heard phrase in our house, and I’m the one who needs to hear it. I come from a long line of worriers. My Dad worried himself and everybody around him so much that I once made him a perpetual calendar that used interchangeable complaints and ailments for daily use. I called it, “Papa Mac’s Ailment Calendar.” At the bottom, I emblazoned the phrase, “For God’s sake and Mother’s, you only get to complain about one thing per day!” After getting upset about it, he actually lightened up and started showing it to his buddies. Worrying doesn’t help a thing, does it? Someone said it’s like sitting in a rocking chair. It gives you something to do, but doesn’t get you anywhere. Jesus talked a lot about not worrying. The most familiar verses are Matthew 6:25-34, but I’m especially partial to Luke’s version of the same passage. Luke 12:22-34 is really neat. Verse 32 nails it: “Do not be afraid, little flock, for your Father has been pleased to give you the Kingdom.” What wonderful words of promise and a cure for worry! I’ve heard from several well-meaning people that there are exactly 365 “Fear not’s” or “Do not be afraid’s” in the Bible, but what I add up with my concordances is about 70-something, even when trying different translations. Sure, it would have made a great devotional book to have one per day as a reversal of my Dad’s Ailment Calendar, but ONE is all we need anyway. If God says it one time then that pretty much covers it, right? However, there are lots of anti-worry passages, whether they have the exact wording or not. For instance, James 1:17 says: “Every good and perfect gift is from above, coming down from the Father of the heavenly lights, who does not change like shifting shadows.” Isn’t it good to know that God is the unchanging source of all that is good! That’s a worry-killer! What about Psalm 46? The whole psalm is great, but I cling to verse 10: “Be still, and know that I am God…” Sometimes I can forget that so quickly, and I end up worrying. I get panicky over little things like where my cars keys are, and big things like Narcie’s health. If only I can wait on God without worrying! Instead I run around and make more trouble for myself and others. Heck, the debit card that I thought was eaten by the ATM machine turned up this morning as I happened to reach behind my car seat. Of course, this was weeks after I had already been to the bank and applied for a new card and put a stop payment order on the old one. I know not freaking out and being still are better choices to make. If I can stop and pray, “Lord, please show me where ________ is, then in that simple little act God usually lets me know which way to turn. It worked last night when searching for my watch! This reminds me of one of the traditions found in the Navy. You’ve probably seen ship’s officers “piped” on board by a Bosun or Boatswain. These sailors use a high-pitched pipe that is like a bugle on land and can carry a specific tune and message. Each “call” is meant to be heard over the din of sounds found on a typical naval vessel. When a disaster or emergency occurs on a ship the Boatswain uses a specific signal called, “The Still.” The signal basically means, “Stop what you’re doing. Pause. Get your bearings. Prepare to do the right thing.” To some it may seem like a waste of precious time, but it actually saves lives. It clears away the confusion of worry and panic, while helping everyone remember their training. In stillness we find clarity that steers us in the right direction. Wouldn’t this world be a better place if we chilled out more before we react poorly and say or do the wrong things? This reminds me of those British “Keep Calm and Carry On” T-shirts with a crown on top? Actually you’ve probably seen variations of them all over the place, especially on social media. In my googling I found out that the phrase was first used on posters and other items in 1939 at the start of WWII. It was a way to bolster the spirits of the British when things looked bleakest and there was the temptation to give up or give in to worry. I’m glad for its resurgence, but God’s been sending this message for a lot longer than 1939! Check out 2 Chronicles 20:1-22 for just a little proof. This passage is a testament to the “Keep Calm and Carry On” theme! Whatever happens today – Pause and be still before God. Don’t let worry kill you. 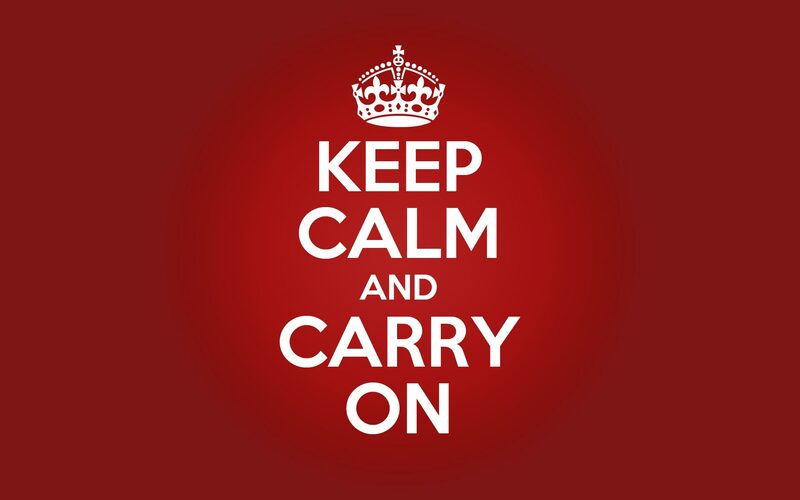 Keep Calm and Carry On! What’s the difference between being a “professing Christian” and a “professional Christian?” This is a daily struggle for me as my faith is lived in the context of being a professional person working for the church, in the church, and is paid by the church. I’m feeling very uncomfortable as a “church professional” these days. I’m in my last season of charge conferences as a judicatory authority in the role of District Superintendent, and I swing back and forth between the grief of seeing these 8 years of relationships end and relishing the thought of being back as a local church pastor. I really miss the rhythms of the Christian calendar as a pastor. As a DS, I pretty much have just two seasons: Charge Conference and Appointment-making seasons. Even though I have tried to remain connected to the Christian calendar by spending lots of time in local churches and with pastors, I am still burdened by the “tyranny of the urgent” in my superintending role! Every day, and I mean every day there is junk that I see as a DS that I never saw as a pastor, and everyone thinks that their problem should be at the top of my priority list. DS’ are in the trenches as the first-line of defense against anarchy and church squabbles. I love being a missional strategist as a DS, but many days I am swamped by an endless litany of minor things. These days make me think that I would rather be a professing Christian than a professional one! I suspect that every pastor, clergy person, judicatory employee, and maybe local church member has had or is currently experiencing a similar thought. I have met local church members who have gradually morphed from being persons of faith to being tired “church leaders,” and in the process they have become jaded by it all. Their cynicism toward church life and the hypocrisy of fellow members and/or ministers makes them frustrated enough to want to quit the church and run back to Jesus. Well, Hallelujah – that’s the answer isn’t it? Maybe, maybe not – we’re called to be in community with other Christians however hard the prospect might be, but we’d better run back to Jesus, too, as job # 1! So how in the world can I get ready to be a pastor again? How can any of us stay connected to Jesus and put up with church life? How can you church leaders out there shy away from the power trip of being “pastor wanna-be’s,” church gatekeepers, power brokers, even “pillars of the church,” and be satisfied with being simply known as a faithful Christian? I am naïve enough to think that if I can nurture being a “professing Christian” once again it might make a difference in my being a “professional Christian.” It’s my hope that the same would be true for all of us. It’s an obvious answer, and perhaps much too simple in our complex world, but could the difference simply be in professing Jesus more? What if I viewed my personhood and existence as a child of God as more important than my duties as a professional “Church” person? What difference would it make if I professed my faith more than worked for the church? I can hear the familiar refrain from countless funerals of “good” Christians over the years: “She/He loved the church and worked for the church – blah, blah, blah.” What kind of message is that? Yeah, yeah, yeah – it means they found value and strength in the community of other Believers, which is true, but sometimes, perhaps oftentimes, it meant they abandoned their families to open church doors, turn on furnaces, turn off lights, serve on countless committees and they lost not only their first love for Jesus but their love for people, too. They replaced a personal living relationship with Jesus with a non-smiling drudgery-laden burdensome guilt trip of working for Jesus. The problem is that Jesus prefers to have people connected to him who then are inspired and empowered by the Holy Spirit to bear fruit for him. Jesus didn’t have people “working” for him. His wasn’t an employer-employee relationship with the disciples. Sure, Jesus had followers whom he sent out, but their missions were by-products of a direct and personal relationship with Him. If I don’t keep the personal connection with Jesus primary then I’m no better than the people Jesus talked about in Matthew 7:21-23 who said they did all kinds of great things yet the Father said, “I never knew you.” Doing, doing, and doing yet no personal relationship is the damnation of many. Do I do what I do for Jesus because of closeness to Christ or has it become a rote routine profession? You want to know one of my problems as a “church professional?” Instead of professing Jesus in a fresh intimate way, I’ve found myself some days blatantly distant from Christ. I end up overcompensating by pretending as if Jesus and I were great buddies and it doesn’t matter what I do or the attitude that I have or the actions that I take; i.e., “Jesus and I have THAT kind of relationship.” Too much familiarity with Jesus by clergy and church leaders has led to the looseness of tongue and behavior that sometimes cripples the church. If you don’t know what I mean, go play golf with a bunch of preachers, or stay up all night cooking bar-b-que with a group of church members. You will witness first-hand the fulfillment of Aesop’s saying, “Familiarity breeds contempt.” New Christians or young clergy don’t need to be exposed to the laxness of “professional” Christians. Professional Christians are one step away from being non-Christian or almost Christian as John Wesley described them. Like the Pharisees who were the religious professionals of Jesus’ day, the institutional church today is loaded with people in both pulpit and pew who have lost their first love of God with all their hearts, minds, souls, and bodies. The result is a “Church-ianity” of tired half-Christians who in someone’s words, “Have been inoculated with so many small doses of Christianity, they haven’t caught the real thing.” Therefore, if you feel more “professional” than “professing” as a Christian today and the evidence is stacking up against you, my suggestion is to reconnect with Jesus. That’s what I need to do! I need to get more personal than professional with the living Christ. Jesus calls us to a personal relationship, a discipleship that is built on a relationship more than religious professionalism. So whatever my discipleship is today, I want to make sure that it is intensely personal with Jesus. That’s why Jesus said, “Follow me.” That’s getting personal more than professional!